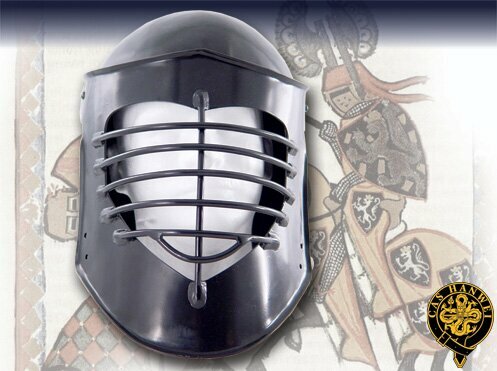 Hanwei Combat Helmet (Hinged Faceplate)(AH2108) Decorative and re-enactment armour, medieval armour, european armour, fantasy armour, japanese armour, for collectors and re-enactors. Our two Combat Helms are both crafted in 14 gauge steel, to comply with the combat regulations of many re-enactment societies, with solidly welded bar attachments. The finish is satin black and the interior is unlined for customization to individual preferences. The AH2108 has a hinged faceplate (hinges up when not in use), while the AH2109 model is of one-piece construction. Bar spacing on both complies with most societal regulations.